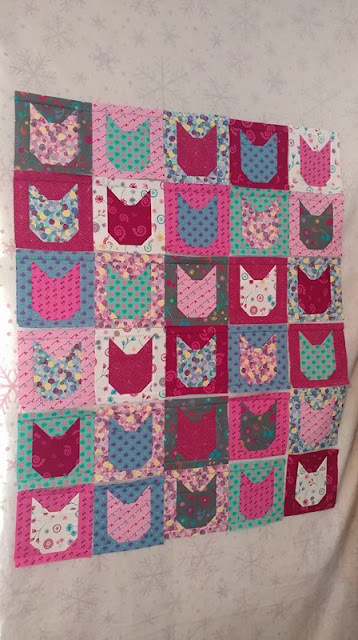 This month, my charity sewing time was spent making one special quilt. In February, Christy's eight-year-old daughter passed away from the flu. 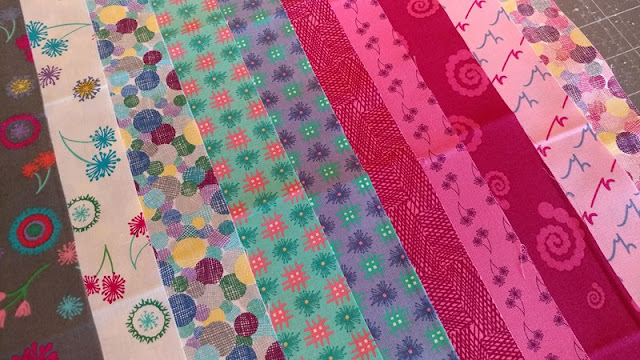 Christy is a member of the quilting community on Instagram, and decided she would collect kitty quilt blocks to make quilts for all of the students in her daughter's class by the end of the school year. 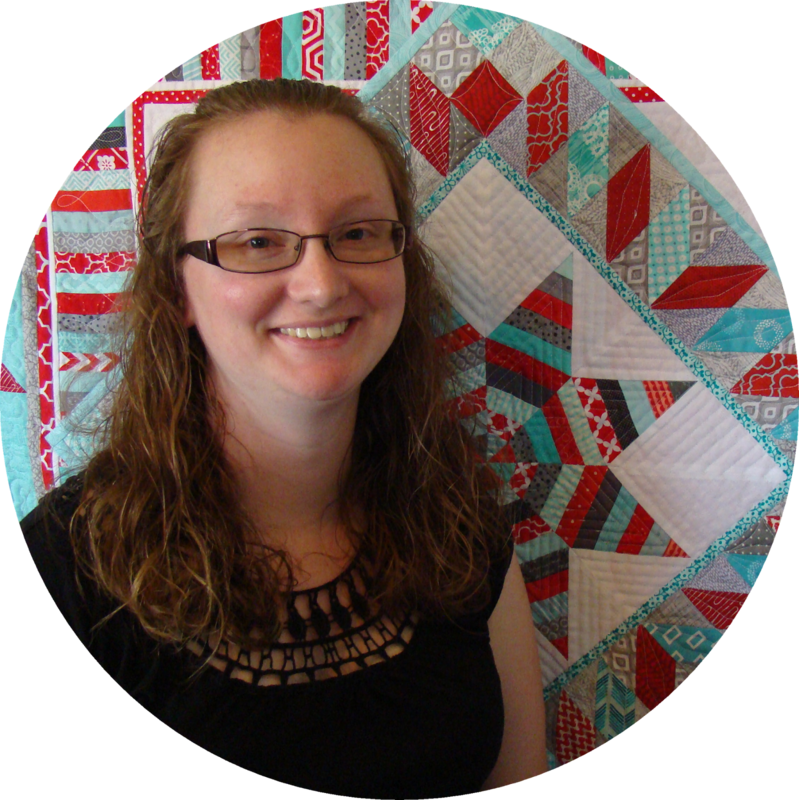 I knew I needed to help by making a quilt! Christy asked for 6" kitty blocks using the free pattern here. 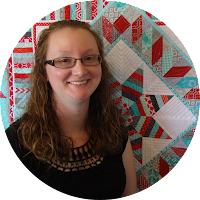 She plans to make 30"x36" quilts using 30 blocks for each quilt. From my stash, I chose a mix of prints that Sarah Maxwell of Designs by Sarah J gave me last year. Some of the prints are from her Dandy Days line, and others are from A Shout, a whisper, A Text. 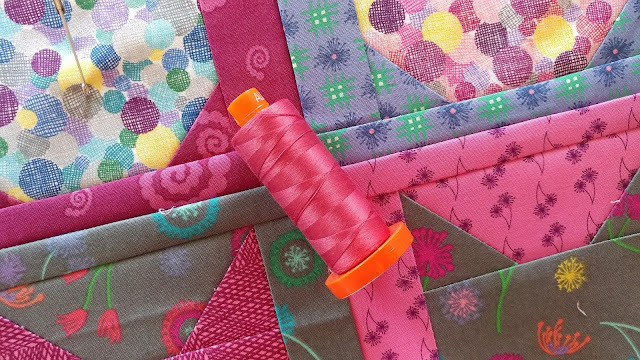 The colors are bright and cheerful - perfect for this quilt! The pattern was designed by Elizabeth Hartman. I love her patterns! They tend to have lots of pieces, but they come together quickly and are easy to follow. It didn't take long at all to have all 30 blocks done. I pin basted the quilt on my dining room table using Warm & Natural batting. 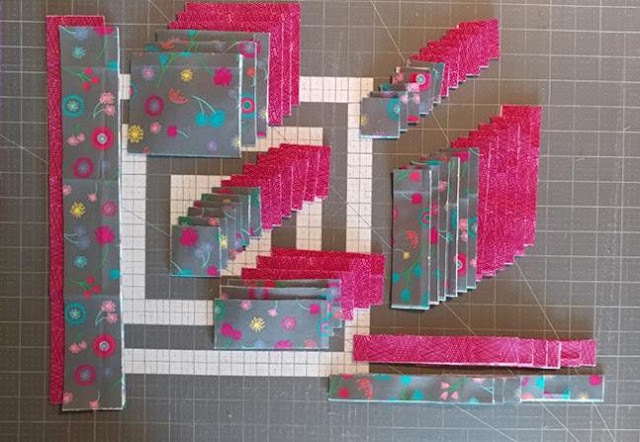 The backing fabric is one I've had in my stash for awhile (since 2015). It's a print from the Ooh-La-La collection by Dana Brooks of Lazy Daisy Cottage for Henry Glass & Co. I bought yards and yards of Lazy Daisy fabric when they closed their online shop. It was only $0.99/yard! I found the perfect color for quilting in my Aurifil thread stash too - 50wt Medium Carmine Red. 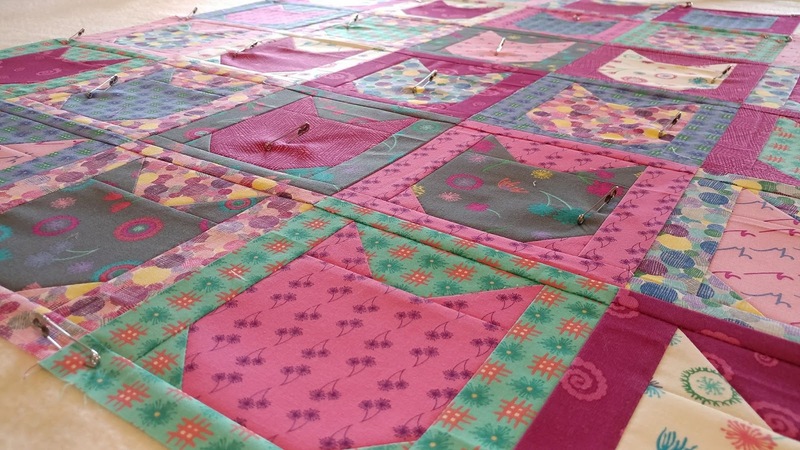 I free-motion quilted meandering loops over the quilt top using my Juki TL-2010Q. It's one of my go-to designs since it is pretty quick to complete! The back isn't a perfect match, but it's great to use what I have in my stash! I sure hope this quilt gets lots of love and use by it's new young owner. Maybe next month I'll get back on track with my Mumm charity quilts. But quilts for a specific need and purpose always get my heart. 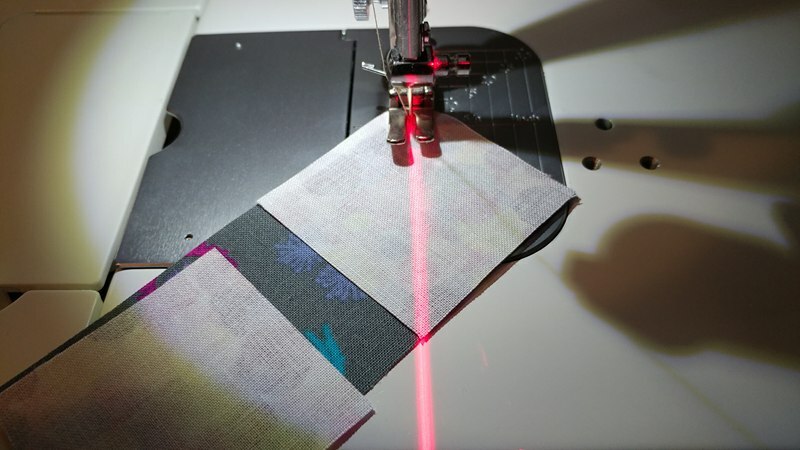 Have you sewn anything for charity this month? Link up! Also linking up with Linky Tuesday at Freemotion by the River, Wednesday Wait Loss at The Inquiring Quilter, Let's Bee Social at Sew Fresh Quilts, Midweek Makers at Quilt Fabrication, Can I Get a Whoop Whoop at Confessions of a Fabric Addict, Finished or Not Friday at Busy Hands Quilts, Friday Foto Fun at Powered by Quilting, TGIFF at Anja Quilts, and Finish It Up Friday at Crazy Mom Quilts. 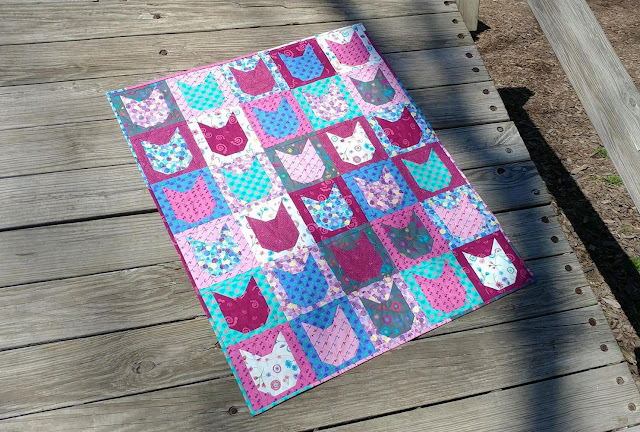 This is such a cute quilt for a kidlet. I hope they treasure it forever! 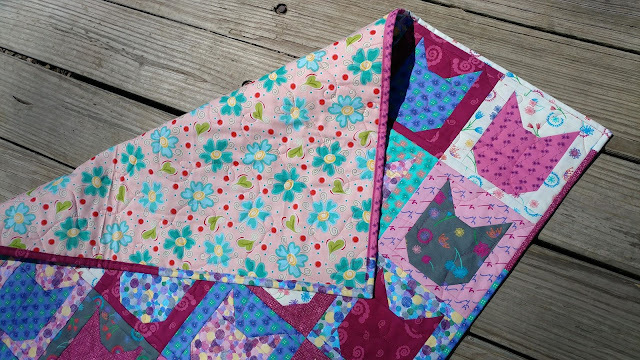 Sarah's prints are so bright and fun and they look fantastic together in the quilt you made. You have such a big, kind heart and I'm sure the quilt will be treasured. Sweet quilt. Wonderful project. What a great way to comfort. Love the little quilt-holder hands peeking out in your photo. 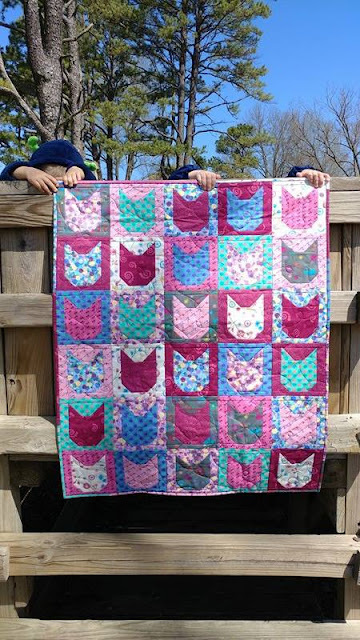 What a sweet quilt for a classmate who has lost a friend. Such a tragic story but such a heroic effort by her mother to make sure the children are comforted in a concrete way. I admire those who can open their hearts when the worst happens. Such a heartbreaking cause. I hope one of the classmates is comforted by these lovely kitties. I can only imagine how excited some child will be when they receive this darling quilt! This is so sad, wonderful and poignant. To lose a child to the flu seems so unimaginable, especially in 2018. How terribly tragic. To be a grieving mom and take on this effort is amazing. Giving to others, especially the young classmates, is a touching tribute to the unbearable loss. 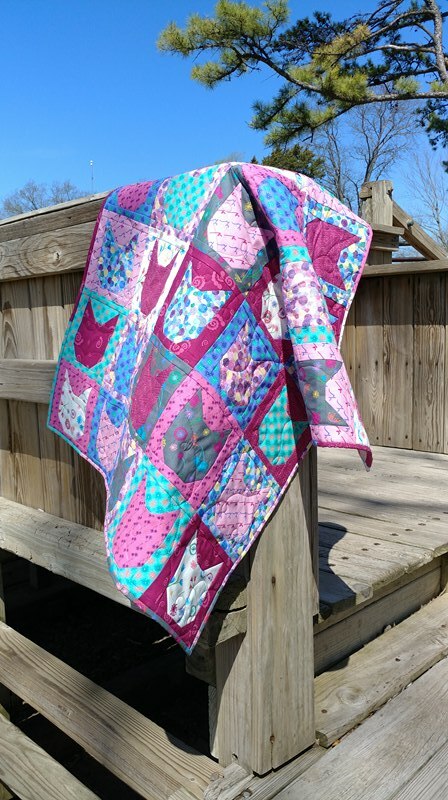 What a beautiful quilt and gorgeous colors too! Any little girl would love to have this! So nice of you to do this. What a lovely quilt. How thoughtful for her to make quilts for the class. They will bring such comfort! Thanks for linking to Wednesday Wait Loss. Great quilt! I love the cat design and the colors and so fun and cheerful. Oh, my, that is so sad, but what a great way to have a memorial for her daughter. 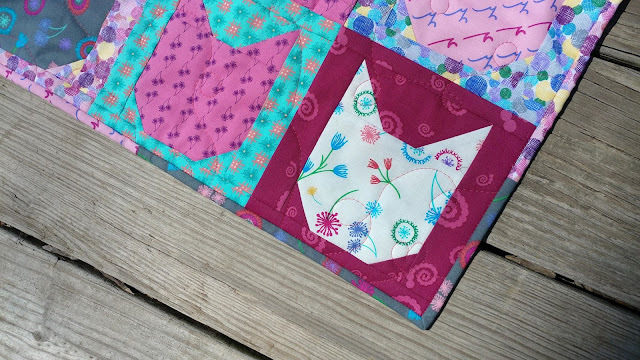 Your quilt is adorable, and how nice that you made the entire thing for her. Very pretty! The fabrics are so fun! So sorry to hear about Christy's loss. Unimaginable. The quilts is adorable. What a worthy and noble cause. So sorry to hear about the loss. But what a great idea to make quilts. Yours is wonderful. Thanks for linking up with TGIFF.